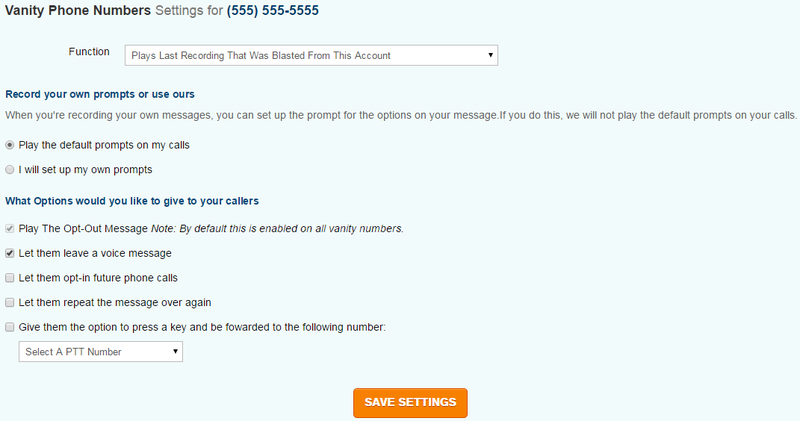 Utilizing DialMyCalls requires a verified phone number to send out voice broadcasts. If you do not want to use your personal telephone you are able to purchase a local or toll-free vanity phone number – a local vanity number is $5.99 per month and a toll-free vanity number is $9.99 per month. In addition to being used as your Caller ID when sending out voice broadcasts through our system, a vanity number has a variety of advanced features that can be used. In fact, a vanity number can be used for the sole purpose of setting up an inbound hotline for you to have people call into and hear a message. For example, a church can purchase a local vanity number, create a new recording every Friday in their DialMyCalls account and then tell their congregation members to call into that number for a weekly prayer request – when people call in it will play the last recorded message on your account. Vanity numbers also include the ability for the people calling in to leave you a voice message, opt-in to receive future voice broadcasts, repeat the message that was played back, and be forwarded to a live person for additional information using our Push-To-Talk feature. Above Image: Manage the additional options for your vanity number. DialMyCalls also lets you control the Caller ID that is displayed when sending out broadcasts from your local Vanity Phone Number. Quickly and easily edit the Caller ID Name (CNAM) from within your account to change the appearance of your number on the caller ID of your recipients. Above Image: Manage the Caller ID Name (CNAM) for your local vanity phone number. *Please note that the $5.99 or $9.99 per month includes 100 minutes of usage and each additional minute is $0.05 – vanity numbers are billed every 30 days until they are canceled by the user. If you would like more information regarding our local and toll-free vanity numbers, please contact us.